Summary: The late-2017 Acer Spin 1 is a niche product, a nicely crafted 11-inch mini laptop with a convertible IPS screen, pen support and fairly good IO and keyboard on one hand, but on the other limited performance, tinny speakers and some questionable design choices. 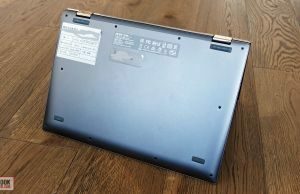 It's also more expensive than most other laptops with similar hardware, but again those don't match its build quality and don't get the same screen. 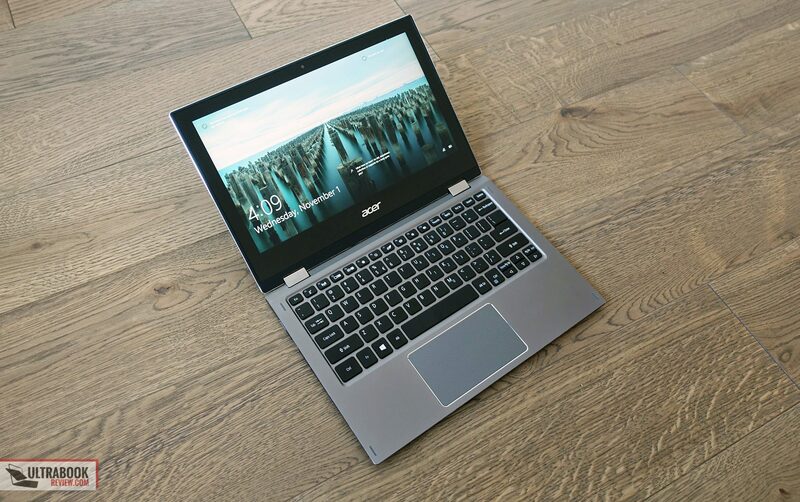 So all in all, if you're after one of these small 2-in-1s, this Acer should be on your list, but if you're not absolutely set on an 11-incher, you'll find better balanced products in the pool of slightly larger notebooks. A few years ago netbooks were highly popular, as light, compact and inexpensive laptops you could easily lug around to school or work. They weren’t very well crafted though and didn’t perform that well either, so eventually faded away. 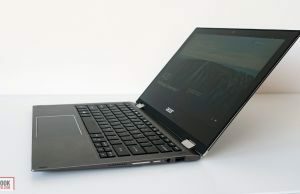 These days there are still a few succesors of those netbooks still available out there, most of them targeting budget users and competing against the affordable Chromebooks in the sub-$300 segment. The late-2017 update of the Acer Spin 1 on the other hand is different. It’s a premium built 11-incher with a fully-metallic body, a nice IPS touchscreen with pen support, a convertible form-factor, a pretty good keyboard and to most ends, the hardware to handle everyday demands smoothly. 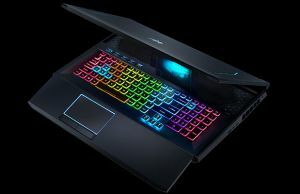 It’s also rather expensive for its class though, with the higher end configurations going for around 500-600 EUR in Europe and around $500 in the US, and at this level such a small laptop needs to impress in order to be worth more than a look. 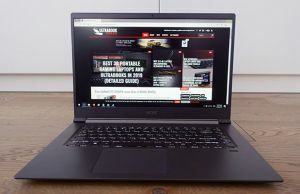 We spent a few weeks with the Spin 1 and gathered all our impressions below, with the nice quirks and the issues we encountered, so by the end of the article you’ll know if the Acer Spin 1 Sp111-32N is the mini-notebook you’re looking for or not. 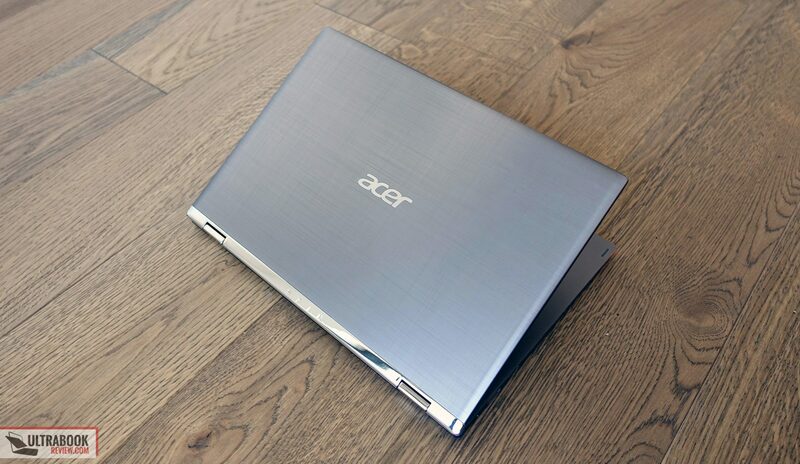 Acer offers the Spin 1 in a few different configurations and the one we have here is the higher end variant. 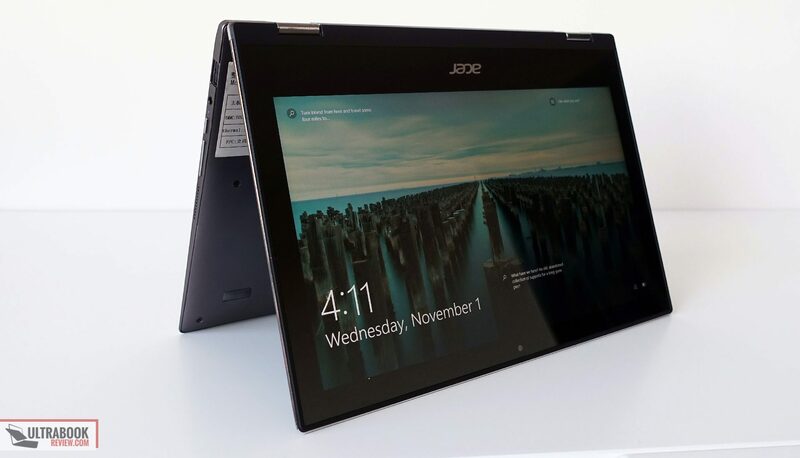 The lower-end version bundles an Intel Celeron N3350 processor, 4 GB of RAM and only 32 GB of storage. 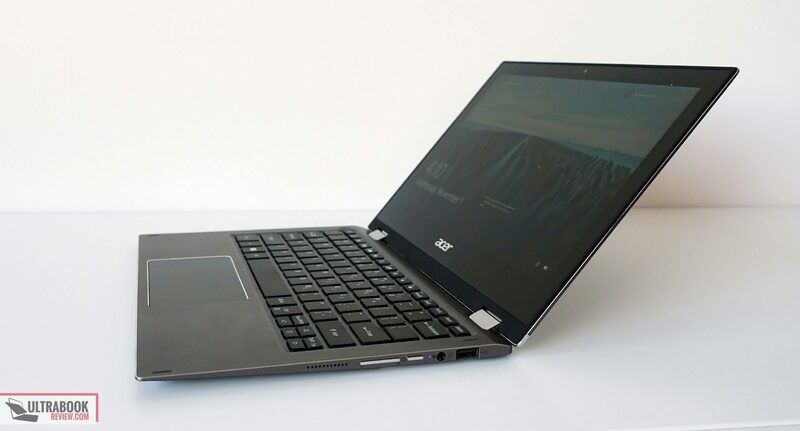 The Spin 1 is not like most other 11-inch notebooks available these days. It’s mostly made out of metal and is very sturdily built, as you’ll feel immediately when you’ll get it out of the box. There’s no flex in the screen, very little give in the keyboard deck and no squeaking when grabbing it firmly. 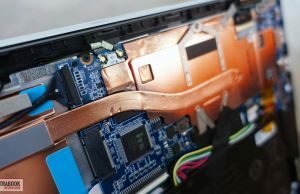 But while it shines in terms of manufacturing, it’s lacks in terms of practicality and finishing, as there are a lot of sharp edges and bits on this computer. The first ones you’ll notice are on the bottom, where the panel doesn’t attach flushly to the edges and the USB ports have sharp metallic corners. 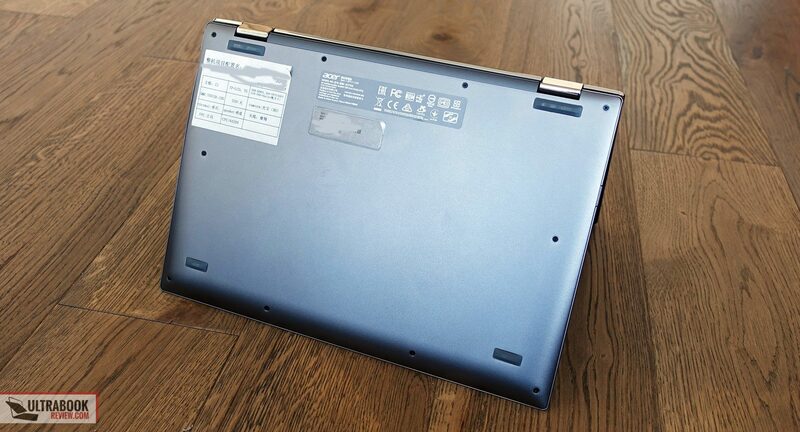 Due to the laptop’s thinness, the USBs are not entirely covered by the metallic edge and leave an open gap on the bottom, with pointy corners, as detailed in some of the pictures below. Then you’ll notice the sharpness of the screen part when trying to open it. There’s no crease on the front lip and the hinges are very stiff, so your fingertips will suffer and you’ll still need both hands to get inside. 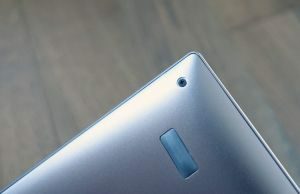 Lastly, there are the beveled edges around the inner body and the pointy corners, but at least the Spin has a low-profile and these shouldn’t be an issue as long as you mostly use the device on a large desk. On the lap or in cramped spaces, they’ll bite into your wrists. 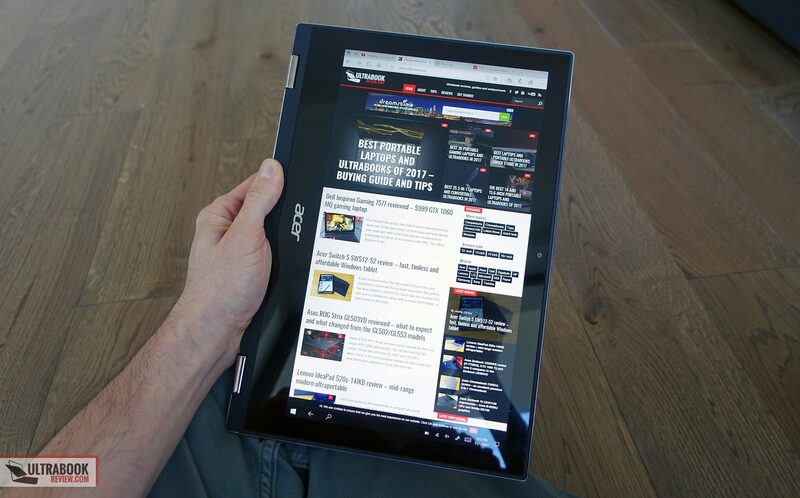 You’ll also feel them when using the Spin as a tablet, because as I’ve already mentioned in the beginning, this one is a hybrid with a 360-degrees convertible screen. The tablet experience is otherwise decent and the strong build and fanless hardware help enhance it. The big bezel around the screen doesn’t though and make the Spin 1 look dated for this day and age, when most tablets and even most 2-in-1s offer much nicer screen-to-body ratios. 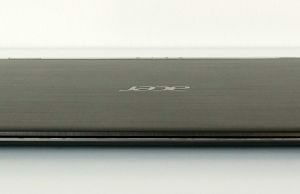 At least the panel is good though and there’s support for Acer’s active pen that we previously tested on the Spin 5. The laptop experience on the other hand is pretty nice, with a decent keyboard, a big enough palm-rest and a screen that can lean back as much as needed. Just don’t forget this is an 11-incher and thus not as roomy as the larger laptops out there. 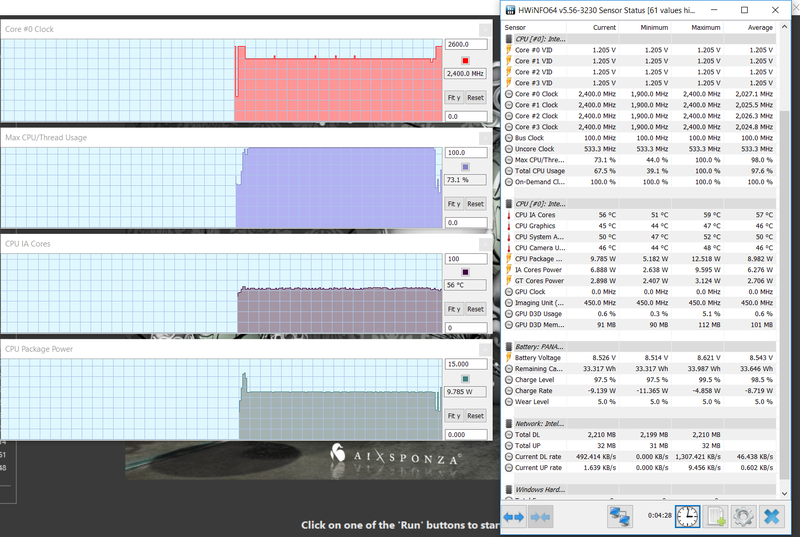 Acer didn’t skim much on the IO either. There are two full-size USB slots on the sides and a full-size HDMI port, but only a microSD card-reader, yet overall the ports selection is superior to what most other 11-inchers offer. Bottom point, the Spin 1 is well made, but not that comfortable to use due to its multiple sharp edges and stiff hinges. I would have also appreciated if Acer put a bigger screen on this one, there’s plenty of room for a 12.5-inch panel with smaller bezels. 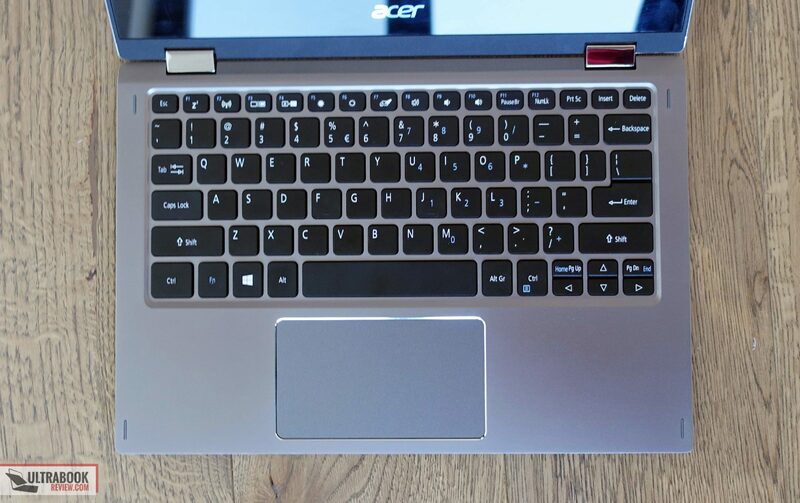 The keyboard on the Spin 1 is a little shrunken from what’s available on the bigger Acer laptops, with 14 x 14 mm keys, but otherwise gets the same layout. 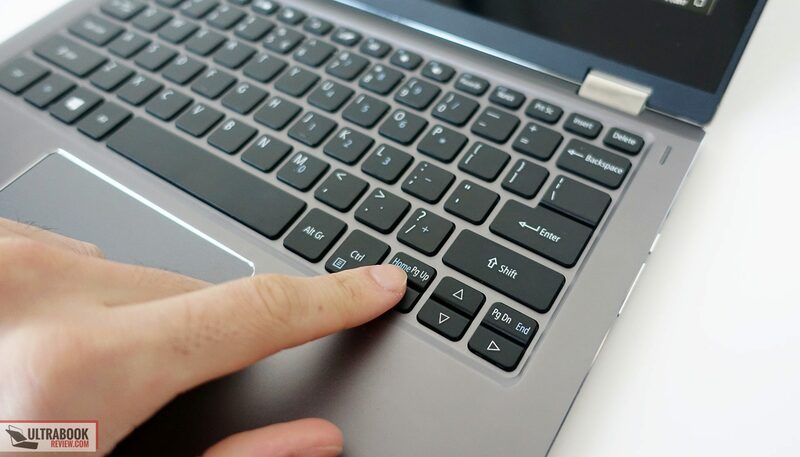 The keys are well spaced, just a tad smaller, and those of you with large hands might struggle with this keyboard. 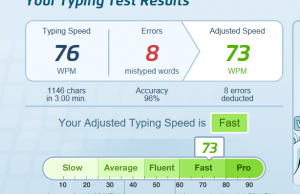 The typing experience is alright if you can get past the potential size issue, as the keys are responsive and travel fairly deep into the frame. 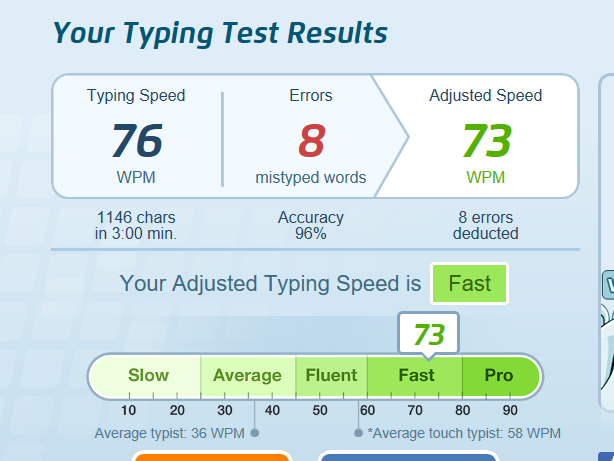 They actuate a little to easily for my taste, which lead to a higher than average error rate during my tests, but typing on this laptop is fast though, and with enough exercise can get fairly accurate as well. Just keep in mind that these keys are rather noisy, so typing in a quiet office or library might raise some eyebrows from the people around. Another important aspect to mention is the fact that this keyboard isn’t backlit, which imo is a little hard to swallow in this day and age. The trackpad isn’t very big and is made out of plastic, but is nicely indented into the frame and works well with swipes, taps and gestures. 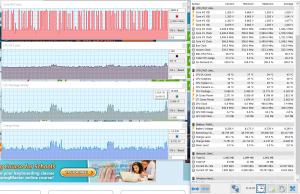 Not much to complain about here, other than perhaps the fact that the clicks are a bit clunky. The Spin 1 gets an 11.6-inch touchscreen with an IPS panel, a fairly good IPS panel actually, with nice colors and good contrast, as you can see below. 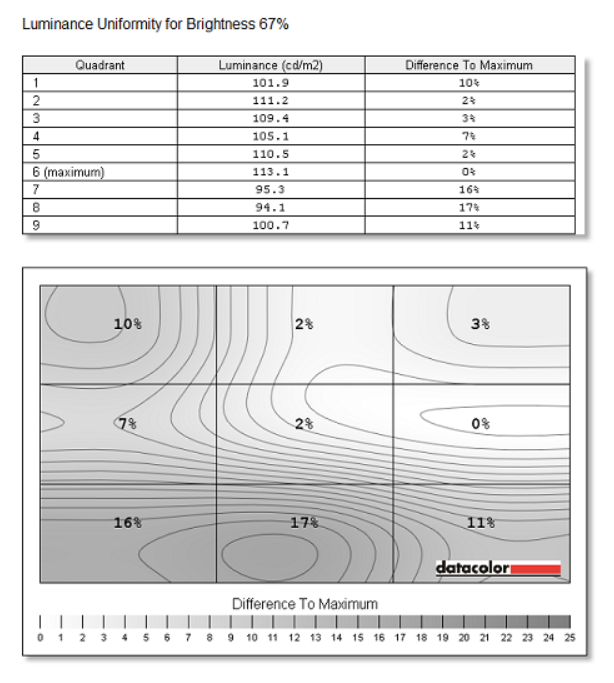 Average DeltaE: 1.04 uncalibrated, 0.60 calibrated. 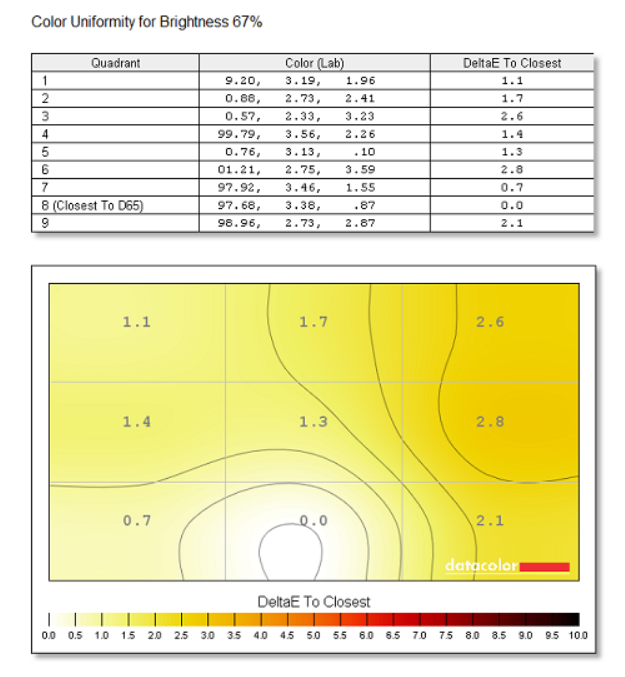 The calibrated color profile is available here, in case you want to correct the default slight gamma skewage and blue tint. The brightness levels might not allow you to properly use this laptop outdoors, especially paired with the glare of the glass layer on top of the screen, but for indoor use this is a very nice panel. I noticed some slight light bleeding around the edges on my unit, but as I’ve mentioned in many other reviews, this is unfortunately a lottery with most notebooks today. 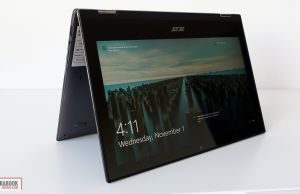 The screen is touch-enabled, includes a digitizer and supports Acer’s Active Stylus that should come included in the pack with retail units. It wasn’t included with our sample, but you’ll find my impressions of this pen over here. 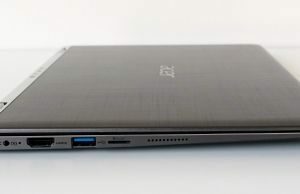 As I mentioned in the beginning, our version of the Spin 1 comes with an Intel Apollo Lake Pentium N4200 processor, 4 GB of DDR3 RAM and 128 GB of eMMC storage. 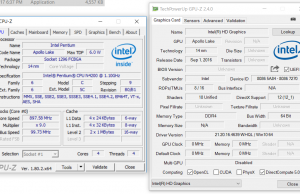 The CPU is a quad-core without HyperThreading, but that doesn’t mean much as it’s a 6W processor with low clock speeds (1.1 GHz base frequency, with Turbo up to 2.5 GHz) and there’s only that much it can do in multitasking. 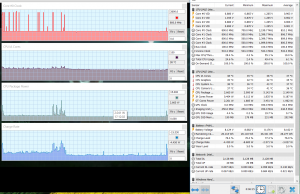 It’s also paired with just 4 GB of RAM, which further limits multitasking, especially knowing what memory hogs browsers are these days. 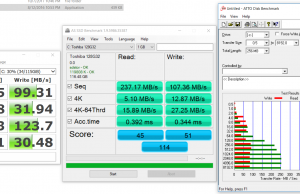 As for the storage, the included eMMC is not as fast as an SSD, but not as slow as the older eMMCs we’ve seen in the past either, so overall it’s not this build’s bottleneck and won’t have as much of an impact on performance as the CPU and RAM. 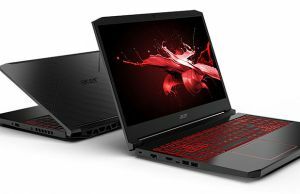 Just keep in mind that Acer also offers this laptop with 32 or 64 GB of storage space and Windows takes a fair chunk of it, so personally I would at least buy a configuration with 64 GB of storage, if not this one with 128 GB of space. You can get inside this computer by removing the back panel that’s hold in place by a couple of Philips screws, but I doubt you’ll have to, as the RAM and storage are soldered and the only components accessible here are the Wi-Fi chip and the battery. 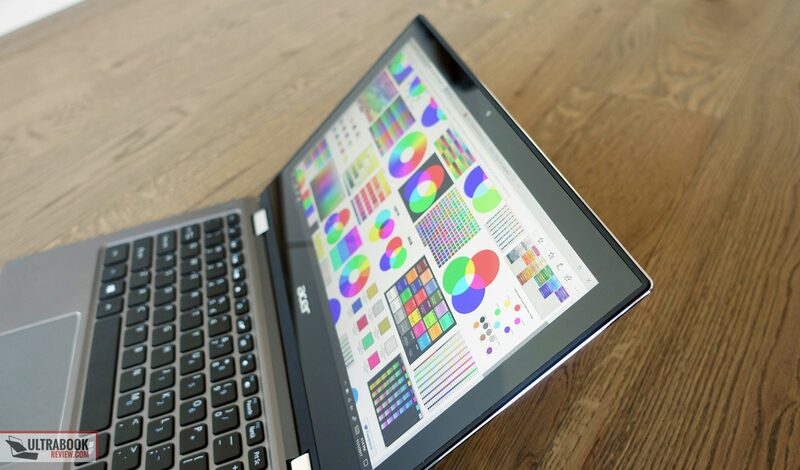 As far as performance goes, as already hinted earlier, this laptop can handle everyday activities well enough (movies, streaming, music, editing texts, browsing, etc), but you’ll want to keep multitasking at bay. 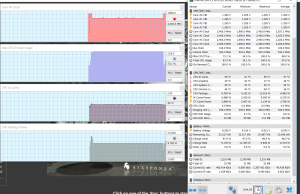 Chrome with a couple of tabs running in the background is enough to send the CPU at 100% loads and at that time you’ll start noticing sluggishness. 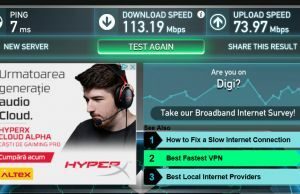 Of course, you should keep in mind that I’m used to the fast response and performance of the modern ultraportables and my expectations are set high. 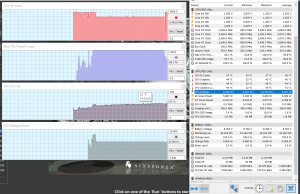 If you’re coming from an older laptop and especially one without an SSD, this might not feel that slow to you. 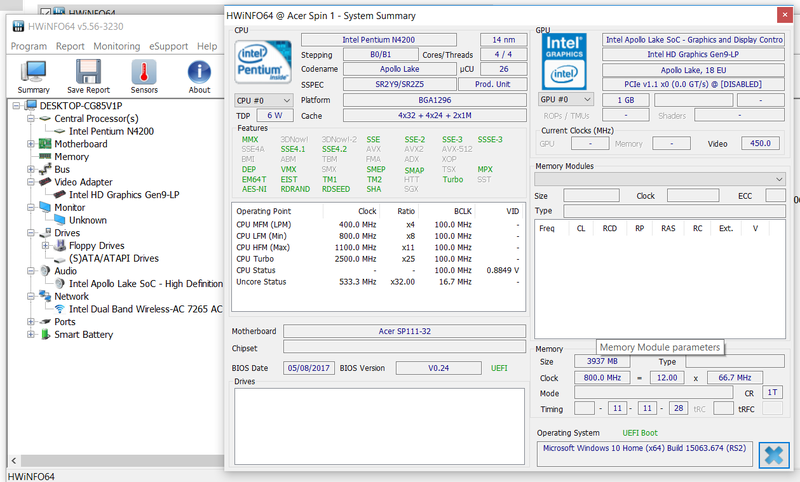 Still, don’t get false expectations, this Spin 1 is nonetheless a low-power computer and it performs accordingly. As a side note, this notebook might feel very sluggish out of the box while it performs its mandatory Windows updates. I’d recommend letting it do its thing for an hour or two and then it should work fine. If you hit CTRL+ALT+DEL and find that the CPU is still at 100% load, you’ll know it’s not yet done with the updates. Unfortunately that’s going to be an issue every time it needs to update though, which is fairly often with Windows 10. 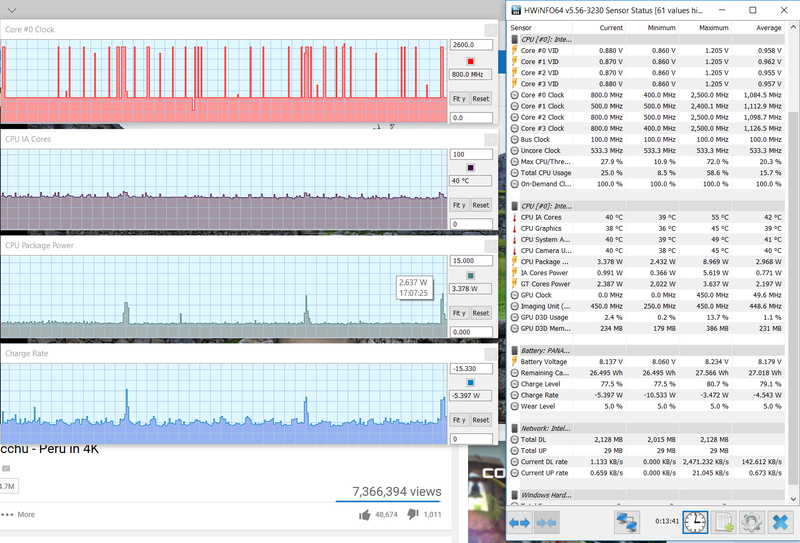 I’ve added some benchmarks results below, in case you’re interested in the hard numbers, as well as some HWInfo logs showing the temperatures and overall performance with everyday activities. 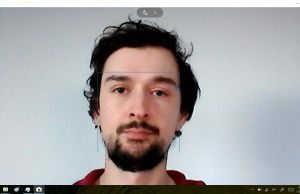 Gaming is normally out of reach for such a computer, but if you plan to run some very old titles at lower resolutions, well, you can. 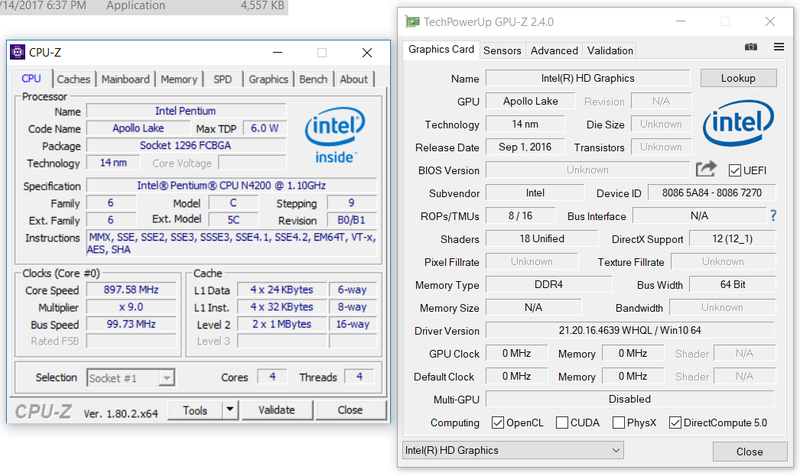 There’s no fan inside inside this computer, no moving parts, and I haven’t notice any coil whining or electrical noise on my sample either, so as a result the Spin 1 is perfectly quiet. 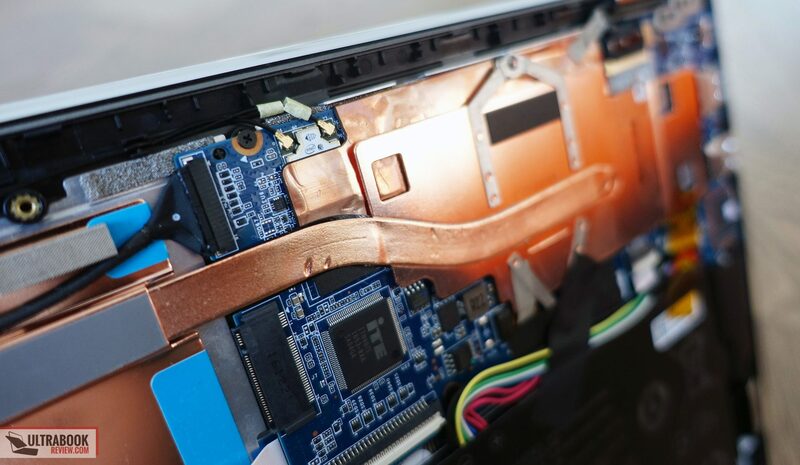 As far as temperatures go, the thin metallic body can heat-up with multitasking, but never to the point where it would get hot or even uncomfortable to use on the lap or hold in hands, which is a benefit of going with the efficient Apollo Lake hardware. 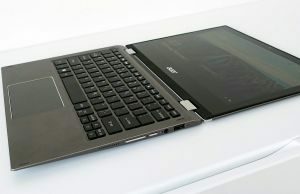 For connectivity Acer went with an Intel dual-band AC7265 that provides wireless AC and Bluetooth. It’s a good mid-level chip and as a result the Spin performed well both near the router and at medium ranges with some obstacles in between. 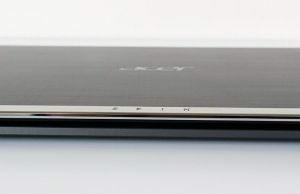 For audio Acer went with a set of stereo speakers firing though small pinhole cuts on the edges. They’re fairly loud, peaking at around 80 dB at head level in our tests, and they don’t distort or vibrate at high volumes either. The sound coming out of these speakers is tinny though, as they clearly lack bass and lows are only noticeable down to about 130 Hz. 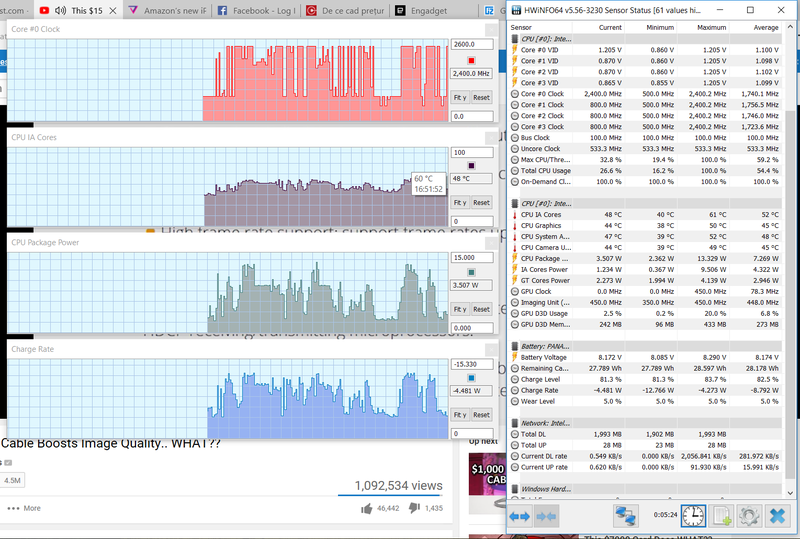 The last thing to mention here is the webcam, which unfortunately is pretty crap, with a mediocre VGA sensor. 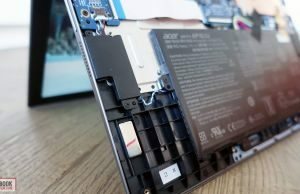 There’s a 36 Wh battery inside this computer, which is fair-sized for an 11-incher and a good match for the hardware inside, even if the IPS panel is a little more hungry than the poorer screens that are usually bundled in this size segment and even if Acer actually had the space inside the frame for a larger one. 8.8 W (~4 h of use) – heavy browsing in Edge, Balanced Mode, screen at 30%, Wi-Fi ON;. The Spin 1 is bundled with a compact and light 45 W power brick and a full-charge takes around 2 hours, as there’s no Quick Charging technology implemented. 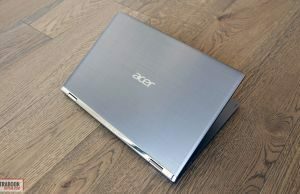 The Acer Spin 1 SP111-32N is only available in Europe at the time of this update, with a starting price of 499 EUR for the Petium N4200 / 4 GB RAM / 64 GB storage configuration and about 100 EUR on top for the model with 128 GB of storage space. It’s not yet available in the US, but I’d expect it to start at around $450 – $500, and we’ll update this section once we know more. 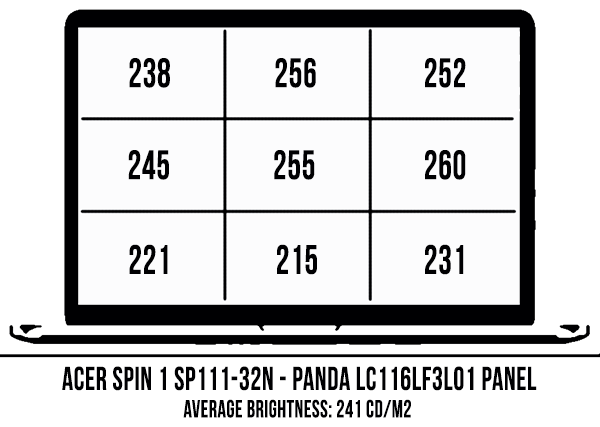 Update: The Spin 1 is available worldwide, follow this link for updated configurations and prices. 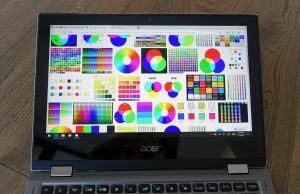 Overall, the Spin 1 is more expensive than other 2-in-1 laptops with the same kind of hardware like the first generation Acer Spin 1 or the Lenovo ThinkPad N24, but that’s not a surprise, given its nicer screen and the premium build. But is the Spin 1 worth that kind of money? 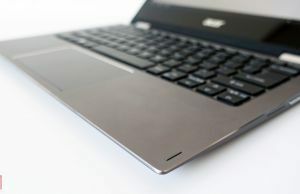 First of all, you’ll have to understand that this is a niche computer and should only be on your list if you’re after a premium crafted mini-laptop with a convertible form-factor and a nice IPS touchscreen, which of course come with a premium. 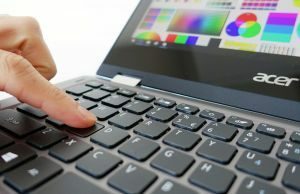 Once you accept these, the Spin 1 is not going to feel overpriced, but you’ll still have to decide if you can live with its quirks, like the uncomfortably sharp bits and edges, the ugly large bezels around the screen, the rattly non-backlit keyboard and the limited performance of the Apollo Lake platform. 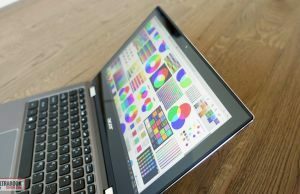 If the answer is yes, and if you don’t mind paying extra for the build and screen, like I mentioned earlier, the Acer Spin 1 could be the right pick for you. 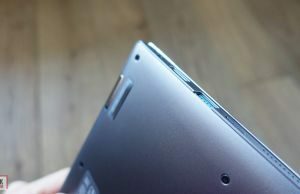 I’d also have a look at some of the exiting 12-inch Windows tablets though, as well as the slightly more expensive Lenovo Yoga 710, which is also an 11-incher, but built on a faster Intel Core Y hardware platform, with more RAM and SSD storage. Or you can go through this selection of mini notebooks for an updated set of other options. 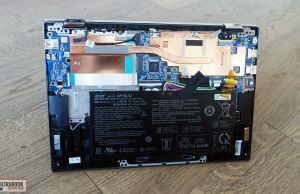 Lastly, if you’re a bit flexible when it comes to the size and weight, you’ll find better balanced products in the 13-inch class of thin-and-lights. 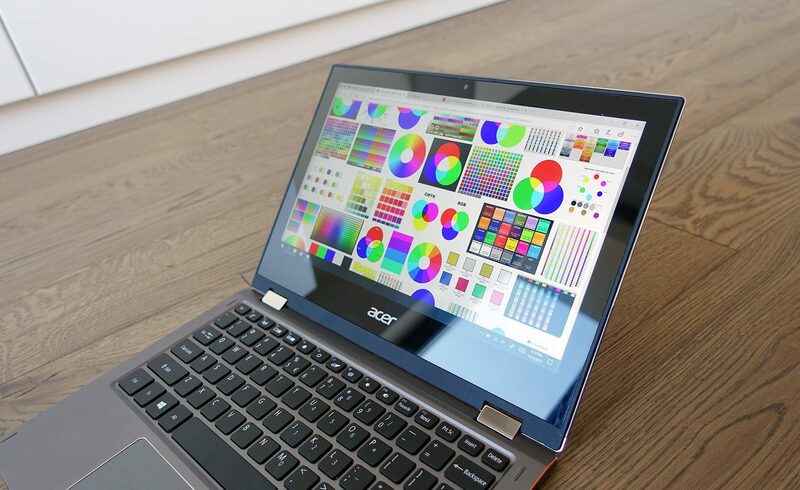 Anyway, that wraps up our review of the Acer Spin 1 SP111-32N, but the comments section is open for your feedback and questions, and we’re around to help out if we can. I've read your article some time ago and among all others on this little guy yours is definitely the best and most detailed, and most importantly – only one about this exact model. So, I'd say this article was pretty much the one, that convinced me to buy it. 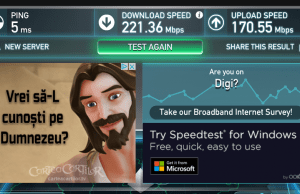 While I've been using it for about last 3 weeks, I'd like to share some experiences with it. 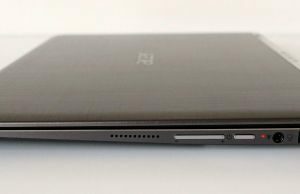 Firstly, I'd have to not completely agree with you about the size of bezels – while it's true for sure, that they could've put a 12' screen, due to weight of this laptop being very different from even rather large tablets, like Apple iPad Air (which I've got in hands for a while some time ago), the bottom of the screen part makes using Spin as a tablet at least considerable comfortable experience, because you can hold it by having your thumb directed nearly vertical to screen and not horizontal, like you'd normally do (because you'd still have your thumb on screen) – this makes your grab sure. 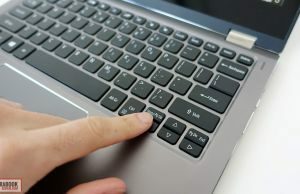 Secondly, I was very, very surprised by the keyboard – I've been using some 15' IdeaPad everyday for last 5 years and having experience with many other laptops I've very doubted, that I'd ever find something more comfortable, but, due to having rather small hands, I must say, that the Spin make quite an impress on me, because it's comfortable as hell! Smaller keyboard allow me to type and not stretch my hands so much. Of course, there are some flaws, like non-configurable function buttons (no option for change in actual BIOS), no backlit (which can be quite annoying, if you have to work often at night) and yeah… it IS pretty LOUD. 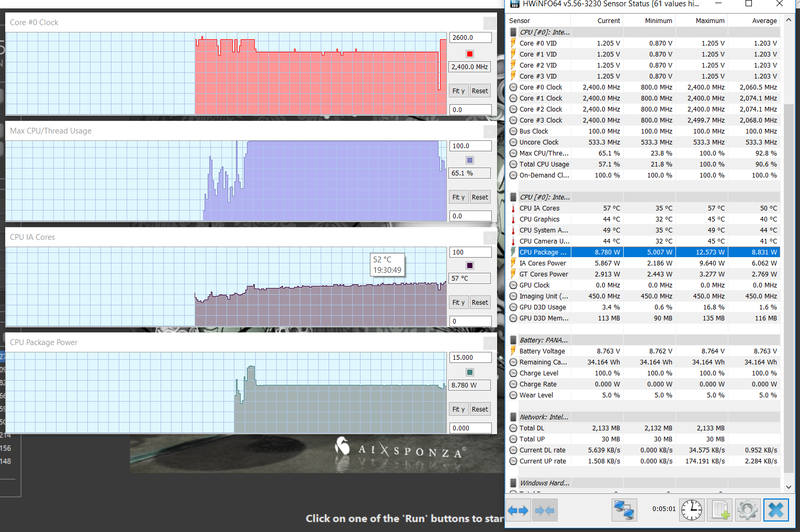 Other than that, I've found it surprisingly good and going to everyday use from standard-size laptop wasn't too hard. Thirdly, while I'm fine with the performance (the eMMC is quite-fast responding and actually enough in size for document-editing and media-consuming usage, just make sure you delete old windows files after full actualization), being unable to play Civ VI makes me quite sad. :P Jokes aside, like you said – for consuming other than games and office work it's just enough – working with few documents opened in adobe reader, about ten cards in browser (firefox, incl. 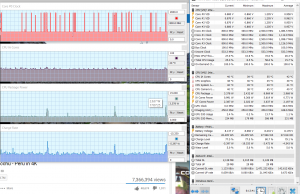 few youtube videos with one playing with background, facebook and few different sites) and editing document it behaves pretty well – maybe non-lightning fast, but still fast enough to make an usage comfortable. 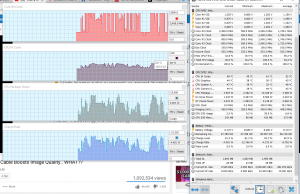 And about the performance, graphic and screen – even, if the screen is rather small, watching some movies in 4K on youtube is still in the range – and honestly, I wasn't that sure, if it will cope with that! Fourthly, I was quite disappointed with the speakers – I didn't expected much, but being rather used to at least superior laptop speakers (if we can name any of them as "superior") and being a bassist doesn't help – they sound quite flat, unfortunately – and not very, very loud. Other than that, if someone is exceptionally sensible to the sound quality or use mostly headphones – then it should be rather enough (with windows sonic drivers for headphones the quality is greatly improved). 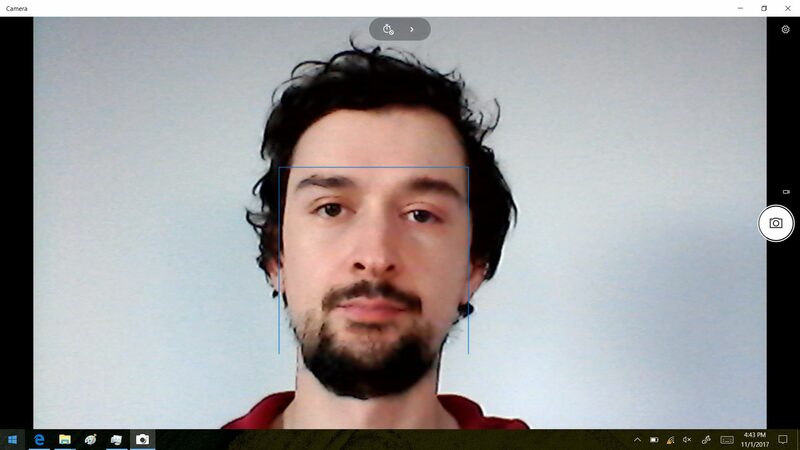 Also, the audio jack didn't recognise headphones as the different device than speakers – just redirects the signal to them – which doesn't allow you to quick change of sound device and force you to disconnect headphones first – a little shame for me, but I guess I'm overly demanding. For the screen I can just confirm what most people say – yes, it's excellent – bright, detailed, with living colours and good touch response – both with finger and stylus (which is in my opinion really, really great – but I wouldn't like to say too much, because I didn't had a chance to use any other active styluses before). 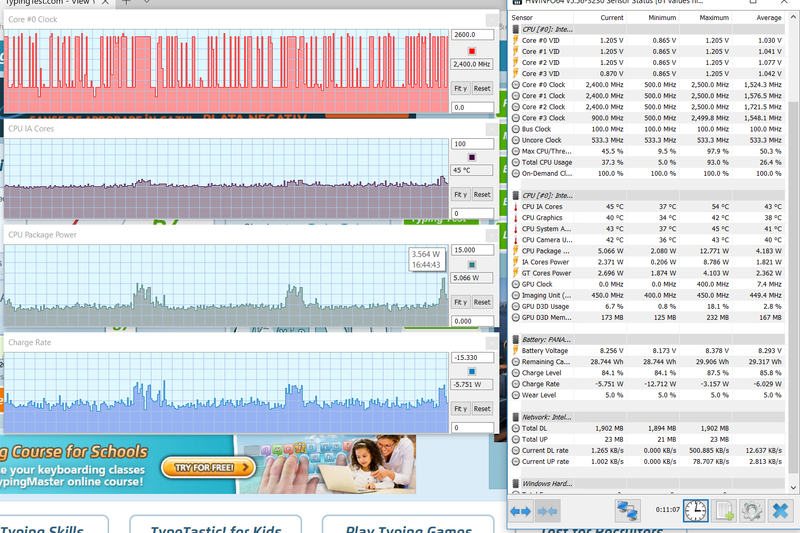 Battery work is OK, I think. 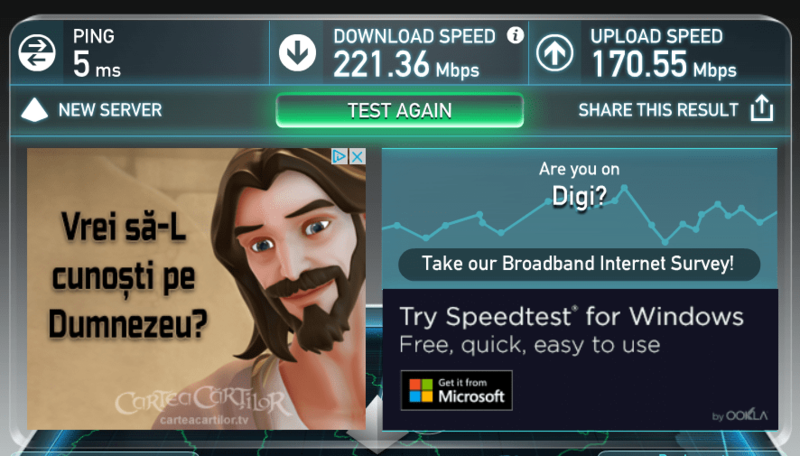 While I didn't actually counted, how long it lasts, I think that infos in article is pretty accurate – I keep in mind tho, that mine lasts little less, because I'm using an USB internet modem for most of the time. There are for sure some little convertibles, that will last longer, but I think this one would be just enough, if someone is not a person, that need a non-stop half-day usage ability. The one and only thing, which I can complain and I'm quite upset is touchpad. Why? 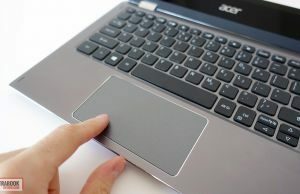 I'll tell you why – if somebody think it's a good idea to put a touchpad in laptop and simultaneously NOT put ANY drivers (and not make any drivers available for download!) allowing you to change any freaking setting, like the god-damn palmcheck, strafes, etc. – then you are bad. And you should feel bad. And even burn in hell, maybe. I've tried to look everywhere for some compatible, install some drivers from older versions of Spin 1 (and going back to stock, because none of them was working correctly, even looking for help on the official Acer forum – aaaaand… nothing. 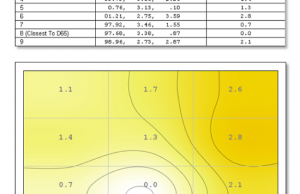 Sometimes touchpad like to stop response for a while and I don't know even why, sometimes it respond correctly for touch just on the one half, I've got no idea, what is going on, but that's the one and only thing, that makes me quite upset and angry. 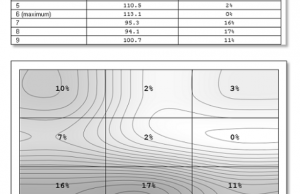 If someone doesn't like to play with settings, then it wouldn't be a big issue. And if someone got a solution for this – I'd be very grateful for some message. But! Other than that, I'm not not saying the touchpad is bad, certainly not – the feeling is actually pretty good and general response is more than decent, for sure. 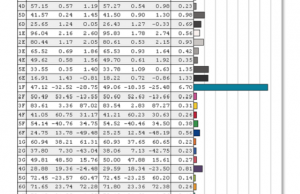 Phew… So, I hope maybe this wall of text will help someone in choice. Overall, I find this convertible very pleasant in use – small, light, very well-build, good looking, efficient enough for everyday academic/office usage. Cheers! Hi Chris, thanks for the extensive feedback, much appreciated. 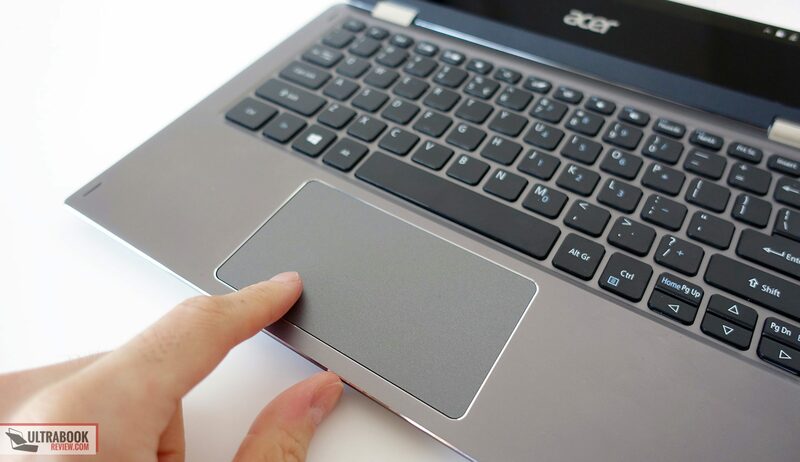 Most touchpads these days get very limited customization options, I don't like that either, but unfortunately there's just nothing us, the consumers, can do about that. 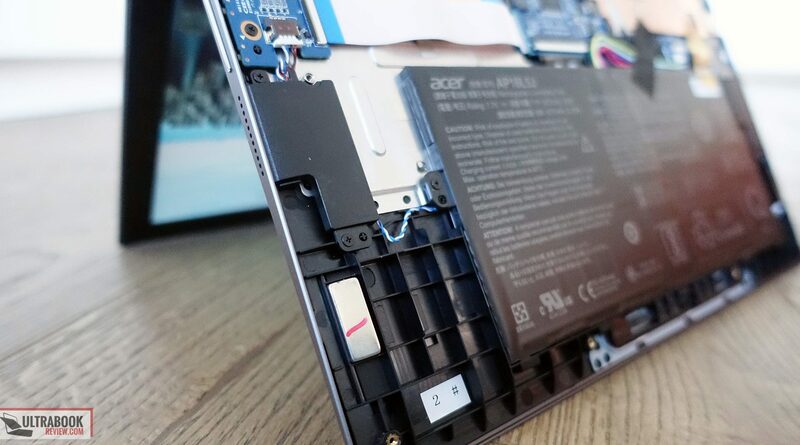 From the photos, it seems there is a m.2 slot and a screw hole for ssd. it seems this way. im also curious about this.from the pictures i cant see precisly m2 slot so dunno if it is there or maybe it is just dummy slot. screw hole is there for sure. 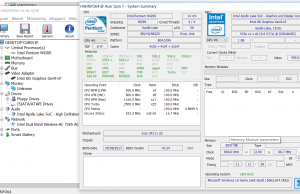 My Spin 1 has not a common Windows 10, the Intel Celeron is opearting a castrate Windows 10, the S Version, it's closed for regular Softwares, more like a Windows 10 mobil OS only for App use. But my most used aplications are custom made Softwares no Apps. The micro SD card is disconnected after standby – the small SSD can not be enlarged by the micro SD card for Data store. The Bios has an unknown password! 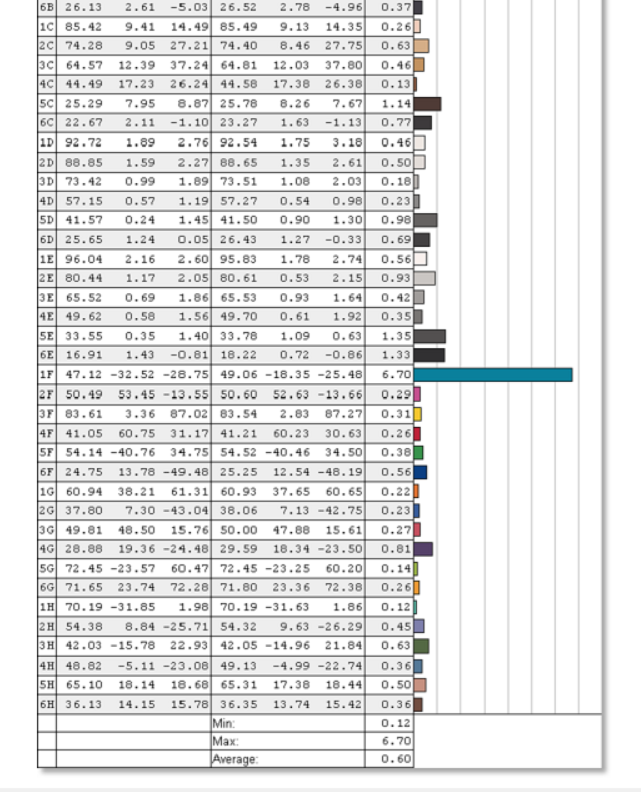 The Acronisstick cann't find the SSD. My Spin 1 SP111-32N-N17H2 does not have the M.2 connector. 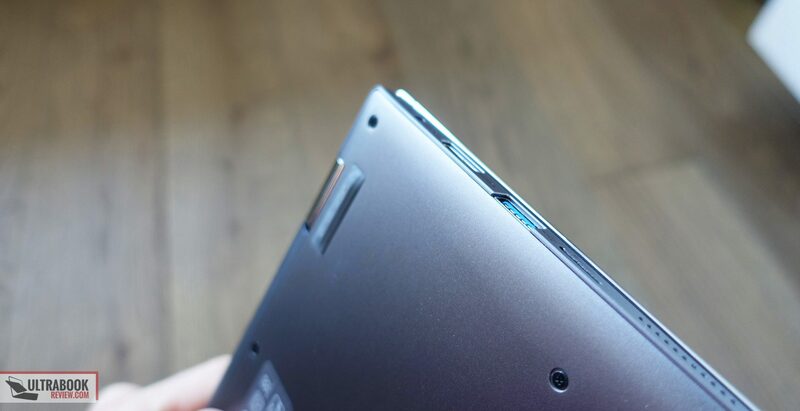 The slot is there but you can't use it as it is just nothing to connect the SSD. Right now I am looking into buying the Spin 1 for travelling, but the versions I want supposedly come with Windows 10 S. I have read that it might be possible to upgrade for free to Windows 10 Home/Pro, but the mentions were almost every single time to "Windows 10 S mode". 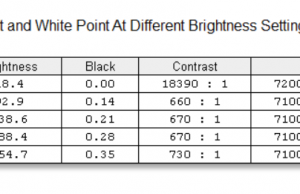 Can anyone explain this to me, and if "S mode" and just "S" is the same thing? 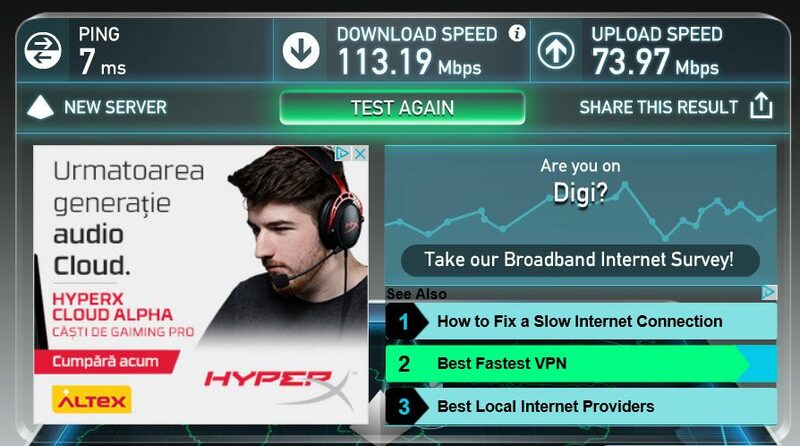 You can upgrade from 10 S to 10 Pro. 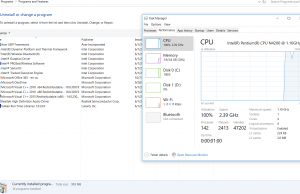 Win 10 is S mode is explained here: microsoft.com/en-us/windows/s-mode . 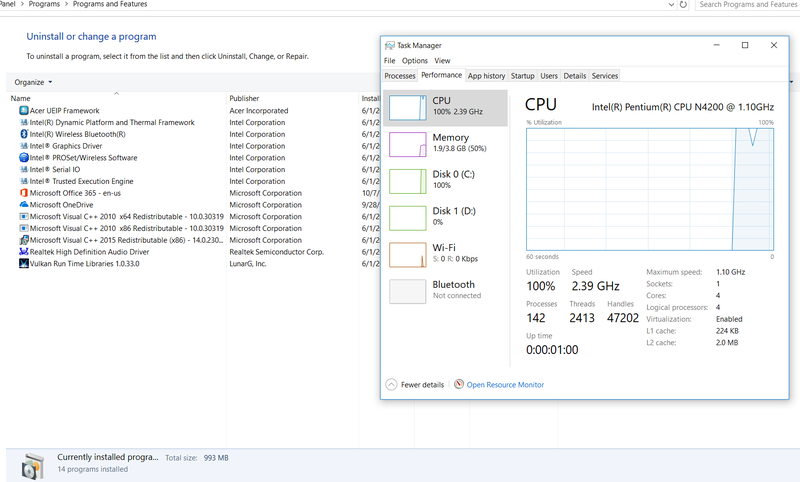 As far as I understand, it's the same as 10 S, but you might want to double check with other sources as well, I've hardly ever used Win 10 S before.